Last day of Quarter #1!!! 1/4 of the way through senior year of high school. Remembering back to my high school days, senior year went by pretty quick. It was exciting to get to the finish line and then anti-climatic when it was over. I went to community college and floundered for the first semester, excelled the second semester, and then went off to a four year school. Floundered again, and found my footing, graduated, floundered, floundered, floundered (that's my new favorite word), went back to community college, and finally got on a career path. As soon as I got a "real" job, I started reading early-retirement books. Work for 10 years and then retire! It didn't quite work out that way. I've been working in the engineering/drafting field for 17 years now. I'm much closer to my goal though. Retire by 50? More realistic. My nephew goes off to visit my sister on Monday. He will spend 12 days in California and I will not have to hear "What's for dinner?" or have to say "Is your homework done?" for all that time. The next quarter will go quicker. He will have more extracurricular activities for choir and youth group. Thanksgiving break is coming soon and then he will go visit his Minnesota relatives for Christmas break. I keep telling him that he should stay and get a seasonal job over the break but he's just not motivated enough. Maybe next year when he is a poor college student he will appreciate the benefits of a holiday job. The weather is great. Still a few days in the upper 90's but the temps are going down. My garden is looking very green but not producing much. I grew my first 2 zucchini! 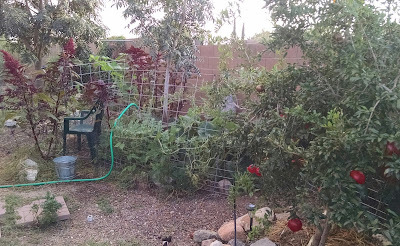 I know a lot of people say zucchini is really easy to grow but it isn't so easy in the desert. 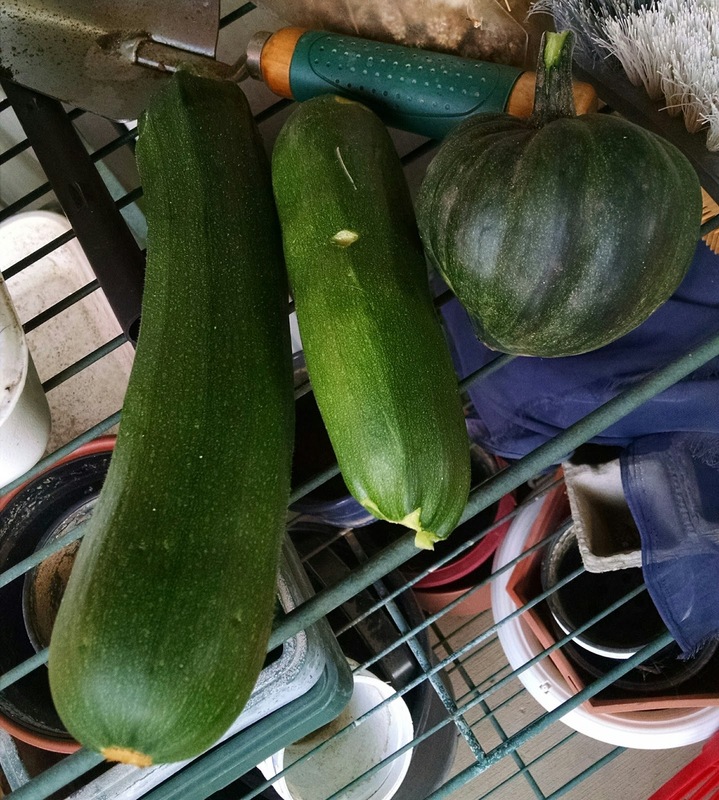 I got four acorn squash. The gourds are not producing anything yet and if they don't get any female flowers soon, I don't think I will get any gourds. The tomatoes don't have many blossoms. The sweet potato vines are doing great. Last year I used the sweet potatoes to grow new sweet potatoes but didn't eat any. I have at least 6 mini watermelons growing from volunteer plants. And the pomegranates are starting to fall off the tree. Usually they aren't ready until the end of October but we had such a warm spring, some of them got an early start. I got more free seeds from the seed library for cool weather plants but I don't have any space to plant them until the squash and watermelon have died. I need a bigger garden. I have plans for a bigger garden after I move out to my property. I have 4 acres. Of course, taming it will take money. Plans for this weekend? My nephew and I will pull weeds in the front yard, go get a haircut for him at the cosmetology school (only $6), visit the cats at the cat shelter to see if Alegra allergy medicine is better than Claritin, cook something (maybe zucchini bread?) and take a nap. Such grandiose ambitions! Autumn came quickly here in NY. We have had above-normal temps most of the month, often hitting 80 and setting some record highs for this day. But then the temps dropped fast so we will barely hit 70 for the next week or so (at least), with the overnight lows in the low 50s. Very nice, September weather at its best. I remember my senior year of high school, too. It began with a cast on my left arm for the first week due to a bike mishap in late July. I had a case of senioritis, struggling in my AP courses until I got going in them - then not caring much about any other schoolwork except for my driving test. I also struggled in my freshmen year of college, dropping 2 classes (gave back my AP advanced credits, basically). But I got back on track in my second year and did well after that. The early retirement bug didn't hit me until I paid off my mortgage at 35. I thought I'd be able to retire by my early 50s but things went better than expected so I got out at 45, 8 years ago. I hope you can get out by 50, Daizy. Wow, time is running away! Congrats on the garden harvests! Pomegranites are my wife's favorites -- who knew they could do so well here in AZ? We may have to get a tree. Look at all that produce, maybe if you can grow it well enough when you move to your land you can set up a veggie stand. For another income stream. I just turned 59 - I don't know if that would be early retirement. I wish I could pull the plug. Medical Insurance is really what I am scared of at this point. The high school to college transition is a difficult one, for sure. So much freedom and responsibility all at once. I like playing the game "if I retired today". It gives me hope because everyday my circumstances get a little better. I know, fall already. Everything speeds up this time of year. I will keep trying with the zucchini. There must be a trick to it. Pomegranates do great. You should definitely get a tree. Takes 3 or so years to get some good size ones. My tree was planted 4 years ago from a 3' tree. I planted one at my first house too which is now my rental. I wonder if my current renters appreciate it. Probably not. Maybe if I had a greenhouse and grew through the winter. The summer is brutal. Isn't Medicare affordable? I'm assuming you are in the United States. Ugh, that is a problem. My mother has Medicare and Blue Shield. The medical people always comment on what great insurance she has. The Blue Shield came as part of my dad's pension plan though. Most of us won't have those choices.